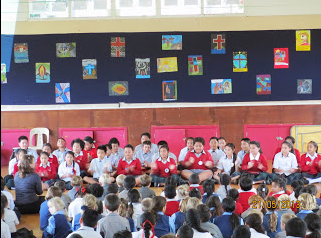 On a lovely magnificent day we were all excited and nervous at the same time because St Joseph’s, Orakei was invited to our school to celebrate Catholic School Day with us. We were all sitting in class on our netbooks waiting for the bell to ring. All the sudden we heard the bell so we got our food and rushed outside. After morning tea we lined up just like we line up at the beginning of the day. Suddenly someone called my name I looked around trying to find who called my name, I looked in front where all the teachers were and I remembered that I was doing a part in the Mass and when I remembered I knew it was Mrs Tui. I lined up with the Room 7 students, I was supposed to stand with Vili and Zeiyhna but Vili was not there with us so we just went to the church without him. Outside the church was all the St Joseph’s students waiting to enter the church. I was really looking forward to read with the St Joseph students. When the St Joseph’s students entered the church my stomach started to have butterflies because I was really nervous, I looked to my left and there were two St Joseph’s students standing with three St Pius students, they were the altar serves and there was two priest’s standing with them, Father Iosefa from our school and Father Terry from St Joseph’s..
We started our mass of with Father Terry introducing himself then we did this short blessing. After the short blessing we had the Prayers of the Faithful. I went up and read my part, I read a short part then it was three St Joseph’s kids talking, they did really well..
lot of St Joseph’s students. After lunch we went to the hall to have a concert. We did an item, our item was the Cups song from Pitch Perfect we had a lot of fun. What an awesome day.